NSL Photography Blog: Should you use your camera's digital zoom? Should you use your camera's digital zoom? It is unfortunate, but more and more digital point and shoot camera manufacturers are choosing to describe their camera’s zoom capability as “total zoom,” instead of quoting the camera’s optical and digital zoom capability separately. Most people are familiar with the concept of zooming, but I’ve found that few understand the difference between optical and digital zooming. As a result, many travelers are devastated when they come home from a fabulous trip, with highly digitally zoomed photographs, to find them blurry, with the jaggies, and lots of noise. In optical zooming, the individual pieces of glass (The are the glass elements -seen above in the cutaway view of the lens; the vertical pieces in the photo having convex and concave shapes.) of the lens are mechanically moved to manipulate the image the photographer wants to capture. By realigning the glass elements of the lens, the subject of the image is either magnified or reduced in size, with the angle of view either narrowed or expanded. When zooming optically, all the magnification or reduction of the subject in the image is manipulated by the lens itself, so that the photograph captured uses the entire sensor area of the digital camera. This is true from the widest angle shot (wide angle focal length) with the least magnification, to the narrowest angle shot (telephoto focal length) with the maximum magnification. In the photo above of surfers at Hookipa Beach State Park in Maui, Hawaii, note how sharp the image of the surfers and the water is. The photograph was taken from more than a quarter of mile away, with an 80–400mm zoom lens set at 400mm, then highly cropped. Because the zooming was completely optical, the quality of the image was maintained, even at the longest possible focal length of the lens. In the strictest sense of the term, digital zooming is not really zooming at all. When you use the digital zoom in a camera, the camera enlarges a portion of the image. It simulates optical zooming. The camera crops a portion of the image and then enlarges it back to the full size of the camera’s sensor, thus “magnifying” the subject of the image. Digital zooming does not focus in as the lens zooms closer and closer, as optical zooming does. In the camera’s digital zoom magnification process, in order to fill the sensor with the cropped image (The size of the cropping is determined by the camera’s zoom setting. The higher the zoom, the smaller the cropped portion of the image.) the camera interpolates the image as it spreads it out, adding new pixels it creates to fill-out the image. The camera’s internal computer creates these pixels by sampling the nearby pixels from the original image. As the magnification, due to the zoom setting, increases, the more spread out the original image becomes, causing the camera to need to create more and more pixels to complete the image. This may or may not yield a satisfactory result, according to your expectations. More often that not, the image will be noisy, have jagged edges, and be somewhat blurry. The more digital zoom used, the worse the quality of the photograph. If you don’t need digital zoom, but have been generally using it instead of optical zoom or to augment it, without realizing how it works, and wondered why your pictures did not look that great, now you know. Sacrificing image quality by using digital zoom to capture the moment is sometimes more important than not getting the picture at all, however I’ve found that most of the time, using digital zoom is unsatisfactory for any reason. 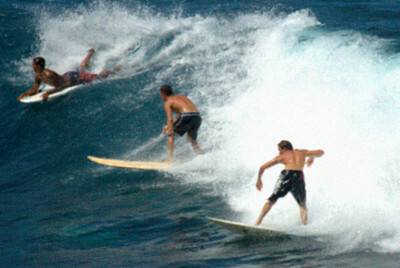 In the photo directly above, of the surfers in Hawaii, I’ve simulated the use of a moderate amount of digital zoom. To me the photo is wholly unsatisfactory, and in truth, if someone tried to capture this shot with a digital point and shoot camera, using digital zoom, the photo would be far worse. The detail of facial features is gone and there is a great deal of noise in the photo. The small size of the image in part belies just how bad it is. Great article as always Ned, but what happened? When I got up this morning there was no new blog articles. I can't tell you how disappointed I was. I needed my NSL Photography fix. I've learned so much and it's improved my photos since I've been coming here every week. I echo Harold's comment Ned. You do a great job for us, in teaching us how to improve our travel photography. My photos are so much better that my hubby can't believe it. So what happened this morning. Was it a computer glitch? I'm going to make this a triple play Ned. What did happen? It's really impertinent to ask I know, but we're really interested. It's a great article. I hadn't realized why my wife's P&S telephoto shots were so bad. I just turned here digital zoom off. I told her she won't be able to zoom as far, but she want have to delete all those bad telephoto shots any more. I use a DSLR, but I understand you can't always write about them. Thanks for your comments. It's always good to hear from you. Two things happened on the way to the Blog last week, to get ready for today's articles. First, I was on a "drop dead" deadline to finish an e-commerce website I've been at for some time. It's incredibly complicated, but while it still needs work, it is up and running. Second, it's the Labor Day holiday, and we were invited to go out which we did. That left little time for the Blog the last few days. In case you missed it, my new Consumer Traveler article, similar to last week's Blog article on Sacred Spaces was out early this morning. You guys get the articles first here. I am an amateur by every stretch of the imagination; but I want to reiterate that I really appreciate this blog. Ned, you do a great job explaining the details to the neophytes like me! John's right Ned. You do us all a great service with your Blog. My travel photos since I began reading your Blog are getting better and better. I never understood the lingo before, but now I can even get help from friends who are no longer frustrated because I don't understand them. Between your articles and your thorough glossary, I'm doing great, thanks to you. Wow, those surfing photos on Maui are great. That's some sweet lens you must have to get such great close-ups from so far away. What did you use to get those shots? John, Barbara, thanks so much for your comment. Readers like you make the Blog very much worthwhile for me. Sam thanks for your comment. I used a Nikon D200 camera (DSLR) with a Nikon AF VR Zoom Nikkor 80-400mm lens. The combo was mounted on a Manfrotto tripod with a Really Right Stuff ball head through the lens mount. When you get lenses as long as that one, with its weight, you attach the combo to a tripod through the lens, not the camera. That way the weight of the camera/lens is well balanced on the tripod and it's much easier to use than if the camera is attached to the tripod. OK, Ned, your advice has never been wrong, but never is a tough act to do, and I wasn't convinced that all these manufacturers would put in a feature, and tout it so much, if it was generally worthless, so I decided to take out my Canon PowerShot SD980 IS and put it through its zoom paces. Oh my, was I surprised! The Canon PowerShot SD980 IS has a 5x Optical and 4x Digital zoom which combines for 20x. I've not had the camera for very long, and had not yet used the digital zoom. I love the camera so far, by the way. So, I tried the digital zoom, and it was awful. I take it you're not surprised? The digital zoom photos were blurry and noisy, which really surprised me, because up until now my photos have been great with a very sharp focus. Once again, I'm taking your advice. I've turned off the digital zoom, and probably won't turn it on again, unless there is some extraordinary need. Of course, as you said, and I've now experienced, I'll probably throw the photo out anyway. I bought my wife a Canon PowerShot not so long ago. She loves it too. I have one as a never be without a camera, camera. They make excellent compact P&S digital cameras. You can make some high quality photographs with your camera. I never understood why my telephoto shots were full of the jaggies and really ugly before. I looked it up on my manual and turned digital zoom OFF! I've joined the group. I've turned my digital zoom off. Ned, some of your surfing photos in your galleries are amazing. I did a similar test to Harvey's and have now turned off my digital zoom too. The loss of quality was amazing. I've read lots of articles which said, "Don't use digital zoom," but yours is the first which explained how digital zoom worked and why I shouldn't use it, so I could actually make sense of the explanation. Doesn't everyone love a parade? Do filters for digital cameras make sense?